Are you following Kerry at Love Those Hands at Home? You can read her entire post here. It’s a gorgeous piece of writing, and one that perfectly captures my feelings of the approaching season. Even in California with our subtle, seasonal changes, the arrival of autumn is unmistakable. Breezes finally blow through the valley, chasing away the ugly smog. The last of the pumpkin vines shrivel and die, but not before gifting us their wonderful fruit. 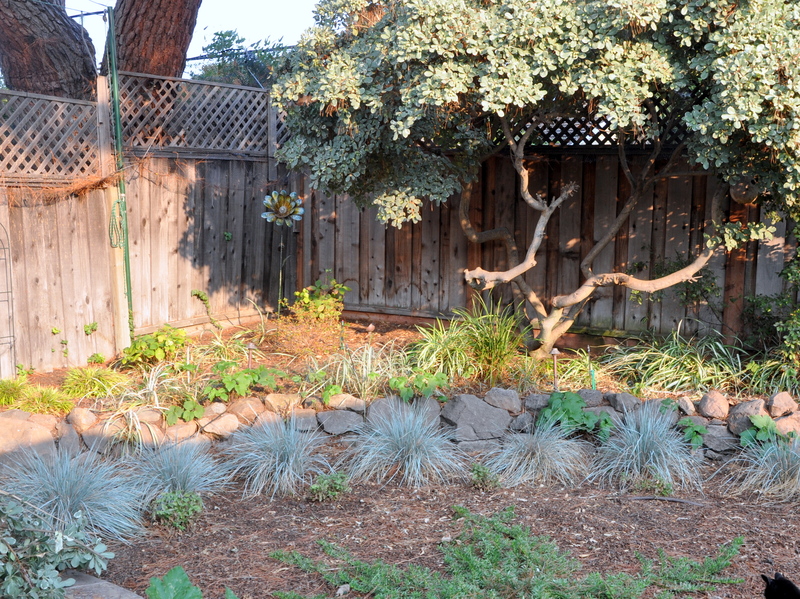 Dusk settles in earlier, and for this fair-skinned gardener, working longer hours outdoors is no longer unthinkable. 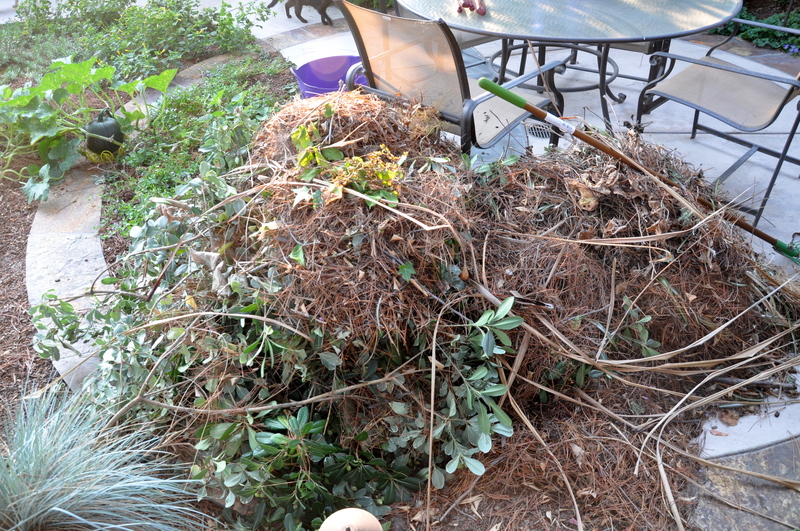 I cleared out the back corner of the garden, pruning away overhanging limbs, dead leaves and the growing layer of pine needles. Look at this pile? Ironically, the pumpkins I planted in May were a complete fizzle, while the self seeded (squirrel-planted) vines were a hit. One of those vines produced four tall, hefty carving pumpkins, ready for our resident, master carver (Mike). A second vine produced one basketball sized pumpkin, took a rest, then pumped out a second pumpkin, turning a lovely shade of orange. A third vine tip-toed up on us, producing a perfect little pumpkin the size of a cherry tomato. Then in the dead of night a critter ate it for supper. Boo-hoo! But wait…another pumpkin eventually took its place and it too is turning orange. Summer is far from over. Even when the autumnal equinox rolls around, we’re still in for a few more heatwaves. That said, the California Gray squirrels have stepped up their game, knowing intuitively what lies ahead. Indoors, Slinky is getting a head start on snuggle weather. 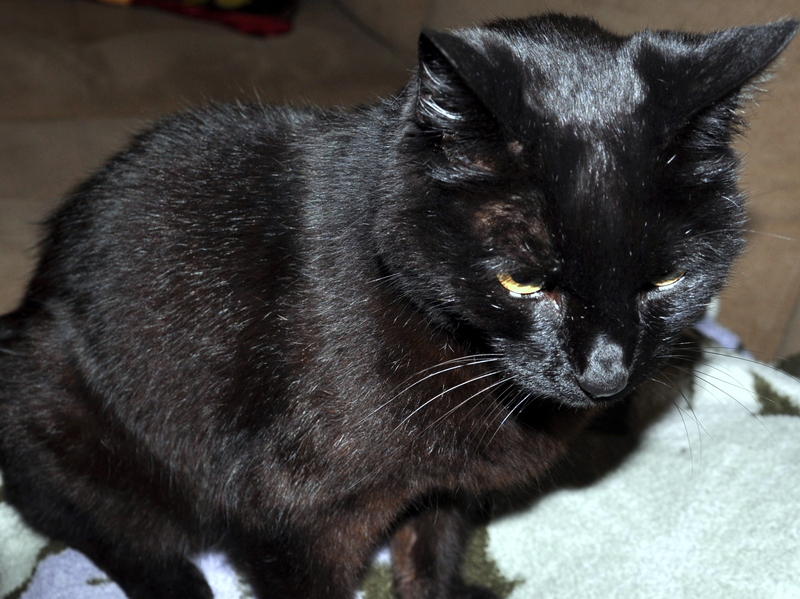 She’s resting in my lap on a soft blanket, her coat still shiny on her diminished frame. I love learning the origin of a word. While I know my Southern Hemisphere friends are looking forward to fall, how about the rest of you? Are you ready to say goodbye to summer and to welcome the ‘fall of the year’? 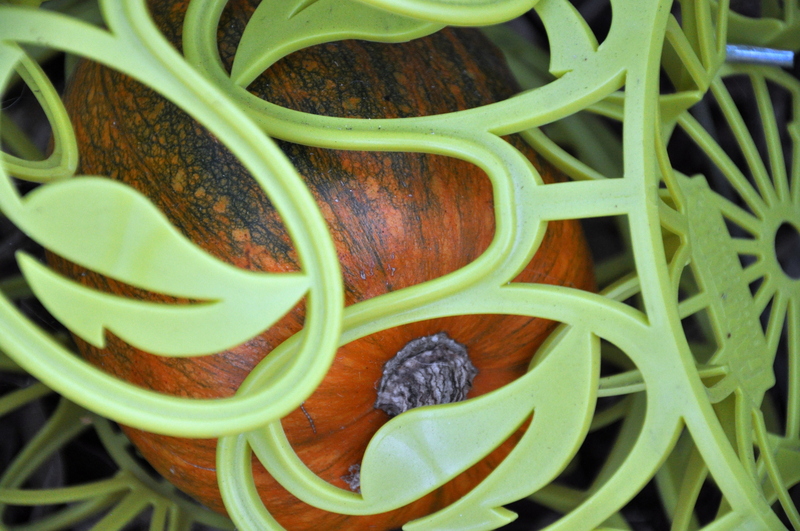 This entry was posted in Gardening and tagged autumn in the garden, fall vs autumn, growing pumpkins in a drought, Love Those Hands at Home, pumpkins, Slinky Malinki, squirrels. Bookmark the permalink. Wet and dry. Interesting. I would miss those seasons most of all. I guess we all get used to what nature serves us. But I think we crave a bit of what’s most familiar, what we knew as a child. Our first Christmas in California was so strange. No snow, no frost, no sledding. As I told Kerry, stop rushing it. Remember what comes after. Winter. Ugh. Double ugh. Fall will be here along about the 20th or 21st of the month. Until then, I’m savoring the last of the summer <:-)= with a hurricane this weekend! You have every reason to forestall the inevitable. I remember the reports of your long winter last year. We’re ridiculously spoiled living in California. I hope you can get away for a mid-winter reprieve in the tropics. No that would be nice!!!! Daffodils and warm days are here! 🙂 Kerry is a long time friend of mine and I love her posts – she writes so evocatively I think! That was an interesting piece about the use of the word ‘fall’. I have never heard it used by anyone other than Americans, so maybe in modern times it has emigrated? 🙂 You have done an amazing amount of clearing in your garden and the squirrels pumpkins look pretty amazing too! I love the protective thingy about the tiny pumpkin. I hope it does a good job! I love that the squirrels are contributing back something to your happiness in exchange maybe for wrecking your swing cover? See, they pay attention and knowing how much you love Halloween, they carefully proffered up pumpkin seeds to the soil………. Hopefully there will be some grand pumpkins to be carved next month 🙂 I have just begun the annual pyjama party here, so may be off line for most of the coming week. Have a wonderful start to September Alys! Thank you, Pauline–have fun at your slumber party! My gosh, Pauline, I’m a week behind again! Goodness me. I can’t wait to hear more about your slumber party. I hope you were properly spoiled. Hurrah for your warm days and daffodils. Spring has sprung. As for the squirrels and the seeds and the pumpkins, kismet. I get a little thrill whenever I see them. Alys! Thank you for saying such nice things and for linking to my post! You wrote a very fine tribute to fall, here, too! And I love that you went and looked up the autumn/fall connection–I was toooooooo lazy but what you found is fascinating. 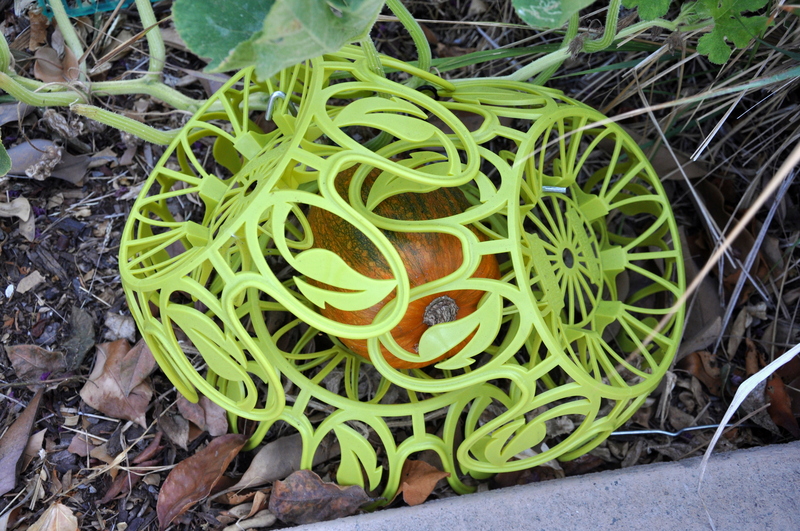 Your pumpkins are great–it must seem like magic to watch those things grow and turn orange. And my older cats know fall is coming, too–they come in earlier at night and are migrating to what I think of their winter spots. Pretty soon their fur will thicken . . .
Pumpkins are great fun. We started growing them as a happy accident when my then three-year-old spilled some of the squirrel feed on the walkway. We brushed it in to the shrubs and from there we grew three pumpkins and a pair of sunflowers. We were hooked! I like imagining your cats migrating to their warm spots. Thanks so much for looking that up for us. I love autumn, the fall of the year. 🙂 The autumn colors and the fall of the leaves. I like what comes after as well. Summer is my least favorite season. I love playing in the dirt and working in the garden, just not the heat. Your refreshed yard looks amazing. The armor around the pumpkin is quite pretty! I’m working on that next week as well. We have rain tonight and tomorrow. I asked for it and mother nature obliged me. 🙂 That will make the yard clean up easier. I will try to get a blog written this next week. I have quiet time coming. 🙂 Yay! Give sweet Slinky a pet for me. Hugs to you. I am more than ready for fall! I appreciate your reference to the subtle California changes as the season shifts from summer to fall. It is indeed subtle, but I have been observing changes in the slant of daylight and my backyard squirrels are feasting on acorns and burying them all over my yard. I love watching them give way to instinct and bury their winter meal even though in Los Angeles, they can count on an easy meal year round. It’s been a long, hot summer and I’m more than ready for fall…by my calculations, the heat should be gone by mid-November! LOL! I love watching the squirrels at work! It’s funny what is pre-programmed over millions of years. They’re busy every fall even though as you say, the supply is steady and bountiful. I love nature. What a sweet hen and how soft and lovely to hold her. I’m happy to hear your garden is hanging in there, but I know too that it can change on a dime when it comes to Edmonton weather. We had a tease of fall last week: cool temps, breezes, slightly improved air quality and the like. Now, bam, we’re back into the mid 90’s F, spare the air and no breeze. Ugh. I’m so ready for fall. I’ve been meaning to read more of the Farmer’s Almanac. Isn’t it amazing how long they’ve been predicted the weather? Weather update, I awoke at the crack of 8am to a smattering of sun…it was trying. By the time I had coffee in hand and bird feed filled and a few deadheads done, it started to rain. That lasted all of 5 minutes, now it’s super cloudy…who know’s what to wear today? So hopefully this will mosy on down your way. Hang in there, Fall is on the way. I’m so glad that I’ve been using the correct term for my favorite season! I’d already read Kerry’s post and agree with you 100%. It’s a wonderful piece. Alys, I’ll always think of you when I see pumpkins. I’m thrilled that you have some beauties. Love that image of the “Under Armour” pumpkin. I’m looking forward to the fall of the year, but enjoying these summer days as well. Laurie, I’m delighted to know the origins of the term fall. All this time I assumed it was related to falling leaves. I love learning something new. It makes me smile inwardly that pumpkins make you think of me. Thank you. We just checked on our last two growing pumpkins today. They’re close to harvesting which will bring us to seven. Love you, Laurie. I too was pleased to learn the term ‘fall’ for autumn. I like both words for this season – and it is increasingly becoming my favourite time of year. We seem to be having a warm end to the summer here but I am looking to a nip in the air. Last winter was horrid as the constant rain meant floss and temps which were as high as the coolest days this summer. Hopefully, there won’t be a repeat this time round. Anyway, great news on your pumpkin front, Alys. Mine are all still babies. It will definitely be well into fall before they come off the vine! Oh gosh, I remember those floods. Let’s hope you’re not in for seconds. I don’t know what they’re predicting for us this winter. I’m afraid to look. We need all the rain you don’t want. I hope your baby pumpkins grow up to be healthy and strong. Are they for carving or for eating? Let’s hope for a decent winter all round – enough rain but not too much! I’ll bet they do. I haven’t roasted pumpkins in years, but my husband makes pumpkin soup most winters and it’s delicious.